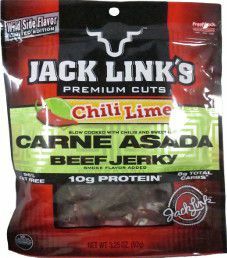 The next review on Jack Link’s will be on a 3.25 ounce/92 gram bag of their chili lime flavored beef jerky. Back in December 2014, while getting off the i81 interstate to fill up with gas, this bag was purchased at a store named Greggs Market Place, in Marathon, New York. 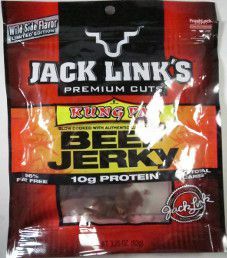 This will be the second review on Jack Link’s Cholula Hot Sauce flavored beef jerky. 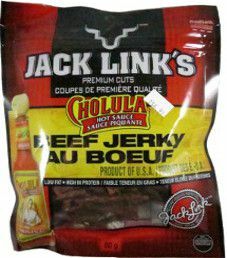 This review will focus on a 2.8 ounce/80 gram of Jack Link’s Cholula Hot Sauce beef jerky that was purchased at a convenience store in December 2014, in Brampton, Ontario, Canada. Update December 2014: For a live taste review, open up Jack Link’s Cholula Hot Sauce (Review #2). 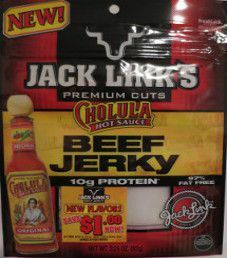 This review will focus on a 3.25 ounce/92 gram bag of their Cholula Hot Sauce flavored beef jerky. 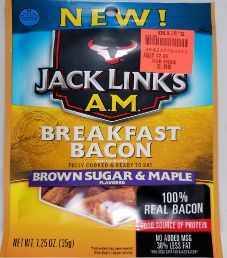 This bag was purchased at a convenience store in San Diego, California, back in 2011.